Product Description American Countryside. Tucked away in a picturesque New England farmhouse is the New Haven dining room set, a flawless counter-height compilation that blends transitional and industrial design with countryside charm. 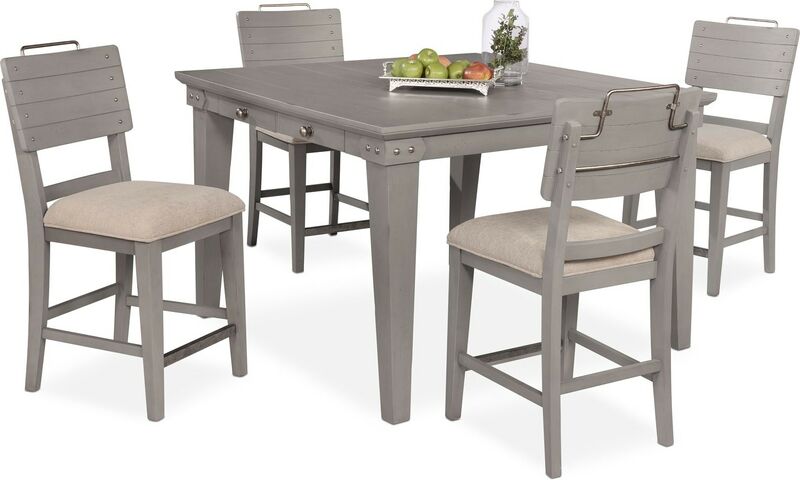 The exposed wood plank tabletop and shiplap stools in a rich gray finish draw inspiration from the timber frames of classic Northeast tradition, while chrome knobs and thoughtfully-placed accents add an artistic touch to each piece. Distressing throughout the set ensures no two pieces are alike. Finish your dining ensemble with the buffet that features ample storage or, for the wine enthusiast, there's the marble top serving cart to complete the look. Customer assembly required. Unique Features: The upholstered seat complements the natural wood look. Four drawers provide extra storage space for dining utensils. A neutral gray distressed finish easily blends with any color scheme. Construction: Rubberwood solids guarantee resilient strength and durable construction. Birch veneers provide natural wood texture. Care Instructions: Spot clean chair upholstery with a mild solvent, an upholstery shampoo or the foam from mild detergent. Petroleum distillate based products may be used as well. When using a solvent or dry cleaning product, follow instructions carefully and clean only in a well-ventilated room. Drawers: Ball-bearing glides ensure smooth open and close drawer movement.